The Fourth Edition has been extensively revised, reflecting new fundamental advancements in this rapidly advancing field. 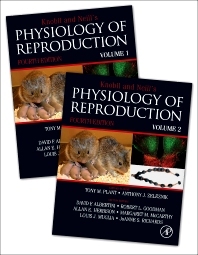 Provides a common language for researchers across the fields of physiology, endocrinology, and biology to discuss their understanding of reproduction. Saves academic researchers time in quickly accessing the very latest details on reproductive physiology, as opposed to searching through thousands of journal articles. Hypotheses Linking Hypothalamic T3 Content to Hypothalamic Neural Changes Driving Seasonal Breeding: A Pivotal Role for Tanycytes? Leptin Signaling and Kiss1 Neurons: Direct, Indirect, or Independent Effects? Dr. Tony M. Plant studied for his PhD with Dr. Richard P. Michael in London and completed his postdoctoral training with Dr. Ernst Knobil in Pittsburgh in 1978. Since then, his research has been continuously funded by the National Institutes of Health (NIH) to study non-human primate models in order to better understand human reproduction. Dr. Plant has been particularly interested in the neurobiology of puberty onset, the neuroendocrine control of the menstrual cycle and testis, the endocrine control of spermatogenesis and, most recently, in the cell and molecular biology underlying spermatogonial differentiation. From 1985 until 2013 he served as Director of a multi-investigator, NIH-funded Center to study the physiology of reproduction, and he served as President of the International Neuroendocrine Federation (INF) from 2007-2010. He is a Foreign Fellow of the Pakistan Academy of Sciences and an honorary member of the Polish Neuroendocrine Society. Dr. Plant is also the recipient of the INF 2014 Geoffrey Harris Lecture. Dr. Anthony J. Zeleznik received his PhD in Physiology from the University of Michigan in 1975. His doctoral work, conducted under the direction of Dr. A. Rees Midgley, Jr., was the first to document that a principal action of follicle stimulating hormone in the ovary was to induce LH receptors on granulosa cells, an action that enables the follicle to ovulate and luteinize in response to LH. Following the completion of postdoctoral work under the direction of Drs. Jesse Roth and Griff Ross at the National Institutes of Health, Dr. Zeleznik joined the Department of Physiology at the University of Pittsburgh in 1978, where he began a systematic investigation on the physiological and cellular control mechanisms that govern the menstrual cycle in higher primates. Dr. Zeleznik served on the Editorial Boards of Endocrinology, Biology of Reproduction, The American Journal of Physiology and the Journal of Endocrinology, as well as having been appointed as a member of three NIH Study Sections.